Feldafing, 12.09.2013: The turbine from Smart Hydro Power has passed its first 6 months of a 3-year test installation in the Inn River with flying colors; even surviving the June 2013 flood season without damages. The turbine is positioned slightly downstream of the „Innstraße“bridge between the cities of Rosenheim and Stefanskirchen on the right hand side of the river. As with most hydropower stations after a strong rain and flooding period, the turbine had to be „cleaned“ or freed of small debris back in June 2013 once the waters had calmed, however the turbine was not damaged, further proving the success of the design. Since June 2013 the turbine is operating continuously producing along its power curve with a maximum of 2 kW at 2, 1 m/s water velocity. The produced power is fed into the grid via a nearby traffic light fixture and compensated by means of the German feed-in tariff policy. It all began back in Q1 2013. Smart Hydro Power was able to install the turbine in April with a mobile crane within a one day installation after a 2-month permitting process was completed. 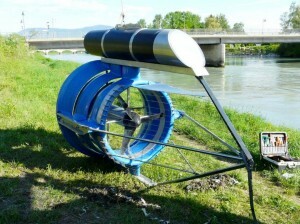 The main goal of the installation is to test an optimized turbine design in a river with large amounts of debris and water level changes. Since the Inn River meets these criteria, especially in spring, it was chosen as the test site. 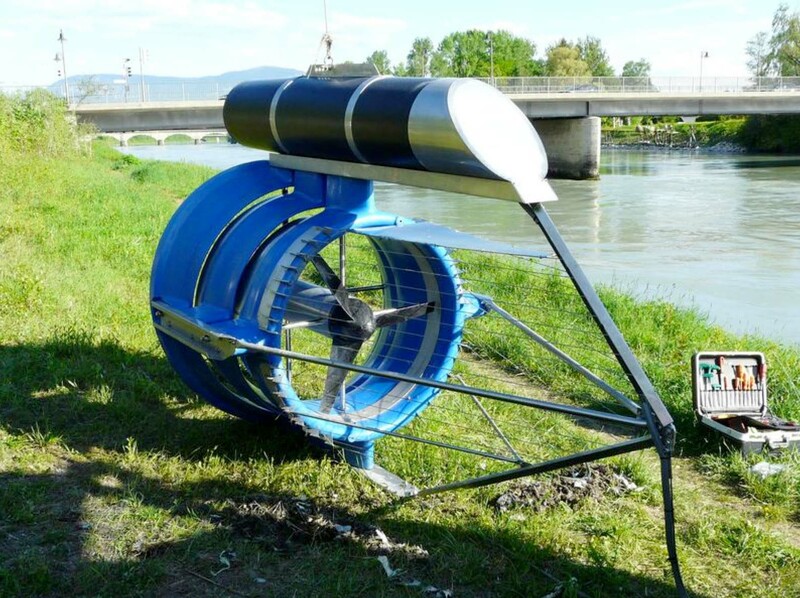 The main difference of this turbine is a single- float design, versus the original double-float design, which provides for a more hydrodynamic, streamlined functioning in water. The new design functions in that the turbine dives slightly underneath the water surface as the water level rises, thereby enabling the machine to avoid the most dangerous types of debris which swim at or near the surface. Furthermore, the integrated tension wires in front of the rotor form a cone-shaped protection to the device and deliver the customer a “complete” design. Due to the extremely positive test experience thus far; Smart Hydro Power feels confident to now enter their core market: developing countries. Next installations are planned for the Congo and Colombia; bringing energy to customers who need it most.